Throughout art history, you can occasionally find multiple versions of the same image. Sometimes the versions are from the same artist (e.g., preparatory sketches), sometimes they are by other artists in other media (e.g., from a painting to an engraving), and sometimes they are copycat versions by other artists. There are several historical examples of multiple versions of the same trombone image. I’ve already mentioned some of these in earlier blog posts. See, for example, The Evolution of a Trombone Painting, about a painting by Baldassare Franceschini, or Canvas, Paper, Silver, Wood, and Glass: St. Cecilia Trombone Image in Many Forms, about an image originally by Pieter de Witte. Also, along similar lines, Young Trombonists in Four Montserrat Paintings looks at two different pairs of similar trombone paintings. 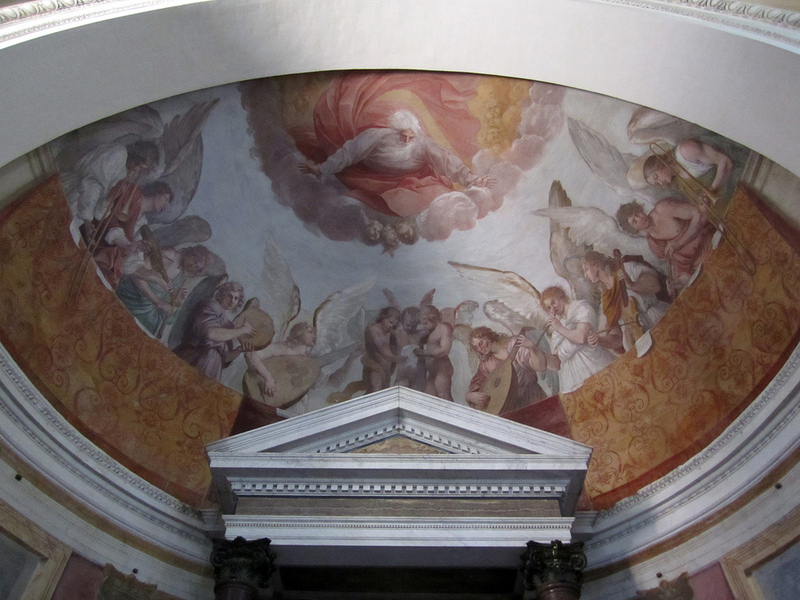 My latest find begins with a fresco painted by Guido Reni in 1609 in San Gregorio Magno, Rome. 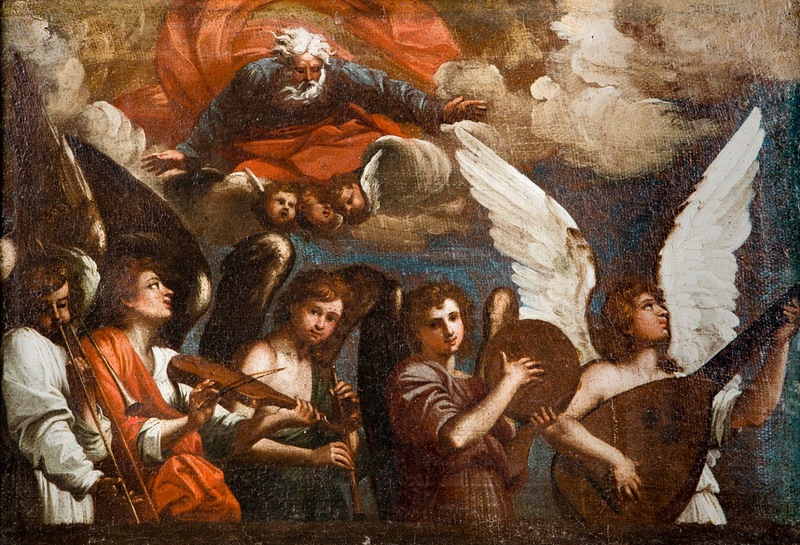 Below is a detail of the left side of the painting, as well as a view of the full painting (notice that there is another angel-trombonist on the far right) (see below 2 images; public domain). Click on either image to expand. Another 17th-century image, supposedly by an anonymous artist from Southern Netherlands, is almost certainly either a preparatory sketch for or a copy of Guido Reni’s fresco (see below image; public domain) (Paris, Louvre; Wangermée vol. 1 287). An unknown artist from the 17th century made a fairly close copy of a similar area of the painting. The artist changed the location of God in the picture because of the lack of vertical space, but the image is otherwise very similar to Reni’s fresco (see below image; public domain). In the late 17th century or early 18th century, Jean Charles Allet (c. 1668-1732), a French engraver who spent the bulk of his life in Rome, copied parts of Reni’s fresco. 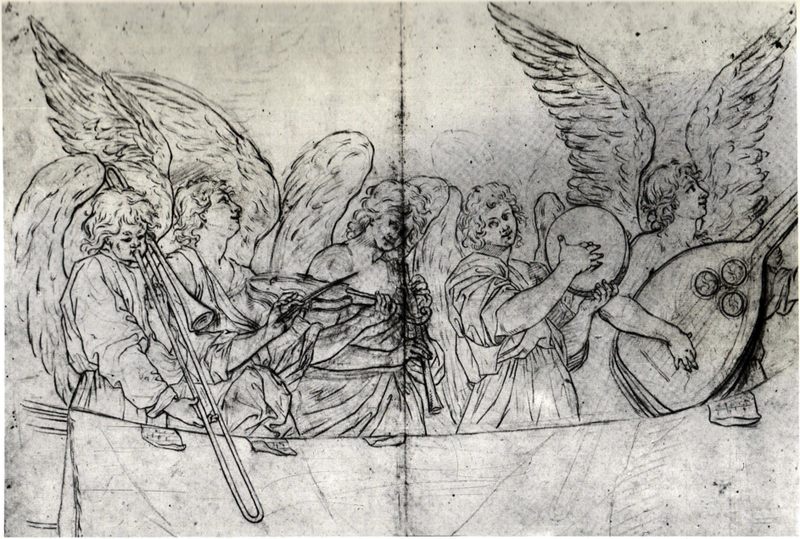 Allet reproduced 6 of the 10 original angel musicians in his engraving, including the 2 trombonists (see below image; public domain) (British Museum). Finally, in the early 18th century, French artist Etienne Parrocel made a chalk drawing of three of the angel-musicians (see below image; public domain; Avignon Musée Calvet Inv. 996.7.31). 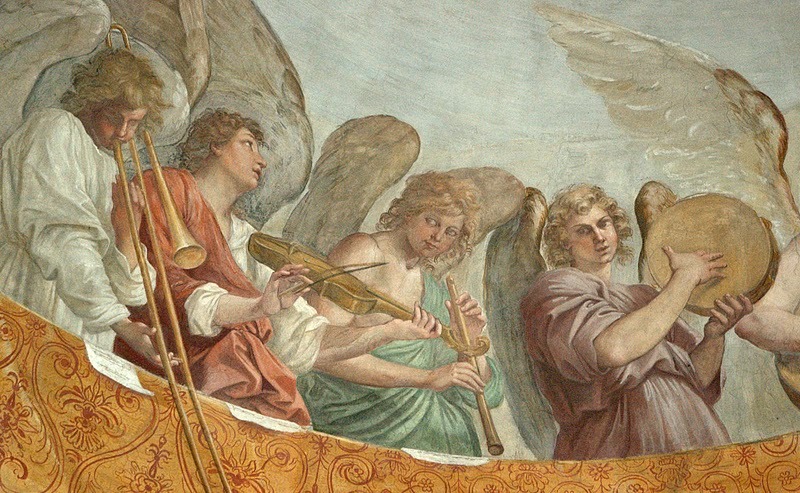 The angel-musicians are obviously taken from Reni’s fresco; however, going from left to right in the original full image, only the first, sixth, and eighth instrumentalists are included by Parrocel. The trombonist’s left-hand grip may have been modified from the original underhand position. 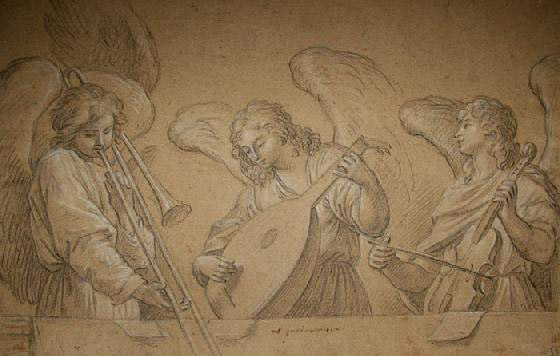 For many more drawings and paintings of trombone-playing angels, see Angel Trombonists Throughout History: 50 Images.